If you liked music, then the Johnson home was the place to be in the late '60s. My brother Phillip always had the latest Motown or Stax singles. My sister Phyllis (yes, they're twins) played the Beatles, and the Stones, and of course Sly and the Family Stone. When he was home from college, my eldest brother, Byron, listened to blues and this guy with an especially raspy voice that he just called Bob (as if he was a friend from around the way). In addition, my Dad liked to play his Miles Davis, Lambert Hendricks and Ross or Duke Ellington records whenever possible, while my mother seemed to know the words to every Burt Bacharach-Hal David song (or at least every one sung by Dionne Warwick). The South Side of Chicago had lots of great music pouring out of its homes, but I'm sure we ranked near the top of the charts. Music added an ever-playing soundtrack to what was already a lively place. Our kitchen doubled as a salon where my parents, siblings, and their friends, held forth on a variety of issues of the day: the Civil Rights Movement, Vietnam, the latest goings on with Mayor Daley and what not. I didn't watch much TV growing up; listening to the discussions in the kitchen was much more interesting. I felt like I was privy to a very cool scene. The events of April 4, 1968 struck us like a ton of bricks. I was only eight and still sorting out the vernacular of violence. I needed to know if shot meant killed and if killed meant dead. I thought these were simple yes or no questions, but I got mostly anguish in response. We used to turn off the music to listen to Dr. King's speeches. That night we turned off the radio. Eventually music came back on in the Johnson household, and as the weeks and months began to pass, even my young ears could discern a change in the sounds. The happy, optimistic sounds that had characterized much of my sibling's playlists had become wary, stern and borderline confrontational. What would soon follow the harrowing days of April 1968 was an era of black self determinism in popular music that remains unparalleled. The line between musician and activist blurred. I recently discussed this era with guitarist/activist Vernon Reid. He started with the groundbreaking electric jazz group, Ron Shannon Jackson and the Decoding Society and went on to form the pioneering rock band Living Colour. In 1985, he cofounded The Black Rock Coalition, an organization that helped pave the way for artists of color to resume a more self deterministic path for their music. His work over the last decade has created dynamic fusions between rock and electronic music. MJ: Where were you on April 4, 1968, how did the news of Dr. King's assassination hit you, and what was the reaction in your Brooklyn neighborhood? 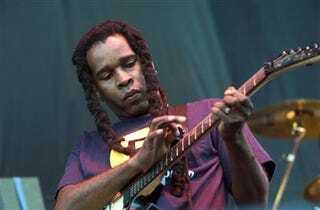 Vernon Reid: It was one of the darkest days of my childhood. Both my parents were very distraught. My father was furious. My mother was as sad as could be. I remember people shouting in the streets—The public rage and sorrow was palpable. My aunts were very upset…. My Catholic Middle school was very quiet too, everyone acknowledged the seriousness of the event. There was a palpable sense that White America itself had done it. Of course, most white folks were deeply ashamed and horrified at the crime too, but these were extremely polarized times. President Johnson, for all his flaws, set the right tone when he addressed the nation at the time of the tragedy, thinking back. MJ: By most accounts, the '60s were part of a golden era for black music, as styles evolved rapidly in many different places, especially Detroit and Memphis, but elsewhere too and sometimes on black-owned labels. However, with the exception of songs like "I'm Black and I'm Proud" and the work of Nina Simone, Charles Mingus and Max Roach, before King's killing most music engaged in little social commentary. Vernon Reid: Black People have always had to watch "what we say" for fear of the consequences and repercussions of our speech. From the Republic's earliest days, the poet, the pundit, the wit, and the troubadour of African descent have always been acutely aware of the expectations and temperament of audience they've faced, very careful to conceal the reality of the lives we've been forced to live, while simultaneously bearing witness to the myriad joys and sufferings of life under varying degrees of constant oppression. It's a neat trick. Part of the genius of Institutional Racism is that long after Ol' Massa's Gone Away and The Last Overseer hung up his whip, fear has been a constant companion of the African American, justified or not. Black performers are uniquely vulnerable to that fear, because the stage exposes and further objectifies. The safest route then is to merely entertain, to make and keep people "happy" (unchallenged and unchanged, but edified). Not to take anything away from the skill and talent required. This is a long and powerful tradition, subverted, raged, and signified against, but potent nonetheless. The `60's Era was a massive turning point in Black popular culture with regards to social commentary—-incendiary change was in the air; the fiery rhetoric of X and King among many others was not to be ignored-while pop music like Motown's was in denial, folk singers like Odetta and Richie Havens heard it all loud and clear, as did jazz artists like Coltrane, Max Roach, Miles Davis, and Charles Mingus… In a supreme irony, Hoover's F.B.I. was searching for the seeds of revolution in Martha and The Vandellas. MJ: A Change Was Gonna Come, however. What impact do you attribute to the death of great leaders like Dr. King and Malcolm X? Vernon Reid: The words and subsequent deaths of King and X had a tremendous effect on a wide range of African American musical artists—the civil rights movement was a motif in much of the work of Curtis Mayfield, Sly Stone, The Isley Brothers, War, Mandrill, Marvin Gaye, Stevie Wonder, etc. In jazz, the evolution of Coltrane's journey into freedom and abstraction was arguably of a piece with the progressive and radical social movements of the time. The screaming saxophone became synonymous with the idea of international black self-determination. With that said, the Deaths of X and King were designed to send another message—this is what happens to Dreamers and Malcontents who step out of line—once again The Fear made flesh asserts itself- Watch your step- It's as current as the unarmed deaths of Amadou Diallo and Sean Bell. MJ: In the years that followed the King assassination, it seemed that black popular music moved toward social commentary and a mood of self determinism took root. Marvin Garye made his opus, What's Going On. Edwin Starr's "War" was a pop hit. The Temptations Masterpiece, and oodles of songs by Curtis Mayfield, Gil Scot-Herron and others laid bare the truth about life on the streets and discontent in the community. What changed and how? Was an iconoclast like Jimi Hendrix influential in his style, if not the way that he brought a new level of virtuosity to music? Vernon Reid: I believe that Hendrix represented the pinnacle of the American Drama—an unruly avatar who heedlessly commingled tradition and anarchy to radically re-invent the role of electric guitar, and radically expand the notion of Black Identity by exploring it's outer reaches. MJ: For you, what were the highlights of this era? Vernon Reid: Jimi's version of the "Star Spangled Banner" during the final set of Woodstock was a defining moment, as was The Band Of Gypsies second set version of "Machine Gun" on New Year's eve 1970. Marvin's "What's Going On" is a masterwork, Miles' work from "In A Silent Way" on into the `70's. Gil Scott Heron's "Winter In America" and "The Revolution Will Not Be Televised." War's "The World Is A Ghetto." Sly's "There's A Riot Going On." JB's "A Revolution Of The Mind." "We People Who Are Darker Than Blue" by Curtis Mayfield. "To Be Young Gifted And Black" by Nina Simone. Fela' Kuti's "Expensive Sh*t." The very first rock concert I ever saw was Funkadelic at Madison Square Garden supporting Cosmic Slop-now that was a highlight! MJ: Why did it end? Vernon Reid: A decade of war. upheaval, and assassinations from Kennedy to King had exacted a generational toll. It's instructive that Marvin Gaye's next big single after "What's Going On" was "Let's Get It On"- no less of an iconic song, but a harbinger of the Me Decade to come. MJ: Was reviving the latitude of this era, one of your principal motives in starting the Black Rock Coalition in 1985? Vernon Reid: The BRC was the start of a community of outsiders who refused to know their expected place. We were certainly influenced by a powerful and courageous legacy of activists like Medgar Evers and Angela Davis on the one hand and artists like Hendrix, Miles, Sly, Ornette, Coltrane, Simone, Mayfield. It was also influenced by the then current artistry of artists like Prince, Fishbone, AR Kane, and Bad Brains who lit the way forward.